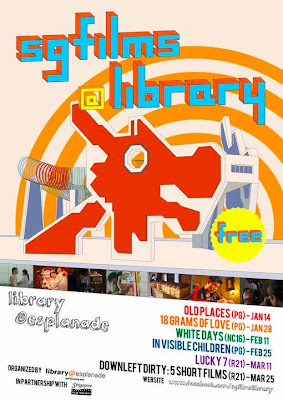 From Jan - March 2011, library@esplanade, in partnership with the Singapore Film Society, will be hosting a showcase of local films - SG films@library. The screenings will take place every 2nd and 4th Friday evening of the month. All screenings will be followed by a meet-the-filmmakers session + Q&A discussion held at the Open Stage of library@esplanade. You can also expect some SG films memorabilia & prizes to be won at the Q&A sessions. VOTE and you can win these prizes! ShoutOUT! : The Blue Mansion DVD,OUT NOW! 2nd Singapore Short Films Awards:The Results!